(CNN) -- Los Alamos National Laboratory announced Wednesday it is notifying nearly 2,000 current and former employees and visitors that they may have been exposed to beryllium in the lab and may be at risk of disease. 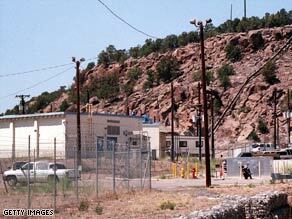 Officials are trying to determine the source of beryllium found at Los Alamos National Laboratory. "Letters went out to all of them today," said Kevin Roark, a spokesman for the New Mexico laboratory. Concern over possible exposure to the hard, gray metal, which is purified for use in nuclear weapons and reactors and also used in bicycle frames and golf clubs, was first raised last November, when a box containing beryllium was received at the laboratory's short-term storage facility, he said. "The package appeared to have damage or degradation of the packing materials, which prompted us to test the area for additional contamination," he said. Surface contamination was found, but it turned out that the box was not the source, Roark said, adding that the source has not been determined. Since the contaminated area had not been tested for the presence of beryllium since 2001, everyone who has entered the restricted-access area since then is being alerted, he said. "It's just one building at one technical area," Roark said, noting that the laboratory covers 36 square miles and has nearly 10,000 employees. Roark said the alert was sent because "we think it's the responsible, prudent thing to do to let people know we discovered this contamination and to answer their questions if they have any concern about potential for exposure." There are no reports of sickness and "we don't expect anyone to be ill," he said. The laboratory said about 240 employees and 1,650 visitors were potentially at risk because they visited the contaminated areas. About 2 percent of the exposed employees could become sensitized, a smaller percentage of whom could develop chronic beryllium disease, Roark said. Inhalation of powdered beryllium can result in chronic beryllium disease, which can impair lung function in people who are susceptible. The risk to the visitors would be "extremely low" because of the activities they performed and their short exposure time, Roark said. An operator will be available at the laboratory at 505-665-7233 from 8 a.m. to 5 p.m. Mountain Time, Monday through Friday.